One of the industry’s best-selling mini-bikes, the PW50 is a fantastic entry-level bike designed to help young riders learn the ropes at an affordable price. 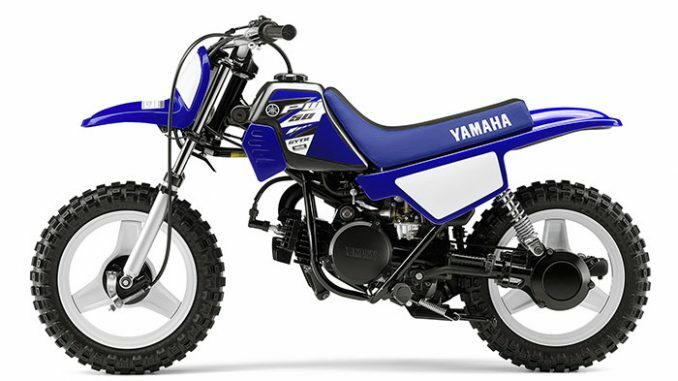 •Fully automatic transmission means no shifting required; the PW50 is a total twist-and-go package. 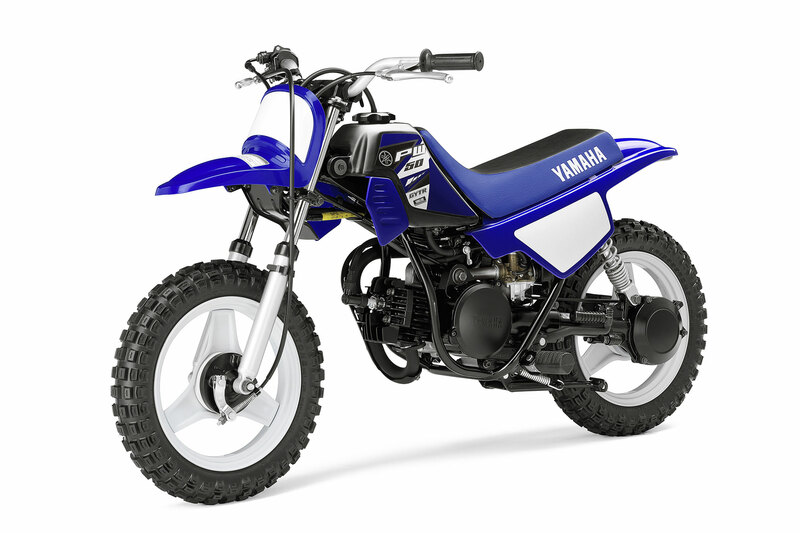 •Torque-tuned, spunky little 49cc two-stroke is built to thrill without intimidating beginners. •A seat only 19.1 inches high makes this one the logical choice for the littlest rider in the group. •An adjustable throttle stop screw lets the adult in charge gradually increase speed as skills improve. •Shaft final drive makes chain maintenance a thing of the past. 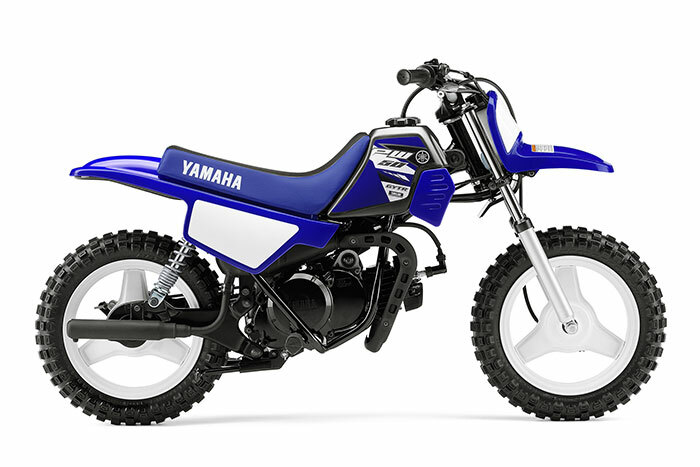 Air-cooled, 49cc, reed-valve, 2-stroke single is mildly tuned to deliver predictable power that gently eases the new rider up the off-road learning curve. Class-lowest 485mm (19.1″) seat height creates a handling-enhancing low centre of gravity and allows most riders to put both feet on the ground for added confidence. •Air-cooled, 49cc, reed-valve, 2-stroke single is mildly tuned to deliver predictable power that gently eases the new rider up the off-road learning curve. •Reed-valve intake system smooths power delivery and widens the powerband. •Single-speed fully automatic transmission means the rider simply twists the throttle to go. This allows a young rider to concentrate on the basics of riding without having to worry about clutching and shifting. •Shaft drive system is virtually maintenance-free and comes fully enclosed for added protection and durability. There is no chain to worry about adjusting or lubricating. •Exclusive Autolube Oil Injection System eliminates the need and hassle of fuel/oil premixing. This system precisely meters the exact amount of oil required by the engine. •Washable foam air filter reduces tune-up costs. •Maintenance-free CDI (capacitor discharge) ignition produces a hot spark for sure starts. •Quiet, environmentally friendly exhaust will keep the neighbours smiling. •Exhaust pipe has been routed away from rider to avoid accidental contact burns. Heat shields also protect young riders from hot components. •Class-lowest 485mm (19.1″) seat height creates a handling-enhancing low centre of gravity and allows most riders to put both feet on the ground for added confidence. •22mm telescopic front fork with 60mm (2.4″) of travel smooths out the bumps. •Dual rear shock suspension with 50mm (2″) of wheel travel delivers a plush, confidence-inspiring ride. •Front and rear drum brakes provide strong stopping power. Hand-operated brake levers are similar to those used on bicycles for familiarity. •Durable, mag-style wheels means there’s no need to tighten or replace spokes. They are easy to clean too! •Specially designed one-piece rear fender, side panels and seat can be easily removed for cleaning or maintenance. •Rugged plastic bodywork resists damage in the event of a tip over. •Plush, motocross-style seat provides ample comfort. 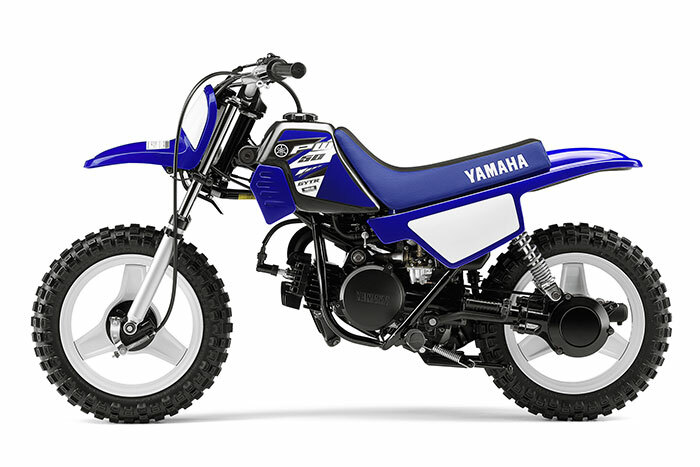 •Team Yamaha-inspired colours, graphics, front and side number plates create styling just like the bigger YZ series of off-roaders. •Large, folding footpegs with rubber grips provide excellent footing even in wet or muddy conditions. •Premium-quality handgrips and levers are durable and comfortable. •Heat shields on engine and exhaust protect young riders from hot components. •Adjustable speed limiter screw on throttle housing restricts acceleration and top speed. •Removable exhaust pipe restrictor allows parents to increase top speed as skills improve. •Start/Run switch prevents unit from moving while in the start position.